In a move that doesn’t surprise but still disappoints, House Speaker Paul Ryan—elected perv who can’t seem to help getting up in women’s reproductive business—stated that Planned Parenthood would be stripped of federal funding should Republicans repeal Obamacare later this month. Planned Parenthood receives about 40 percent of its funding (roughly $500 million per year) from the federal government. This money does not cover abortion services, instead, it goes to basic reproductive healthcare such as cancer screenings, contraception, and STI testing. Despite a national demand for Planned Parenthood (in the U.S., 2.5 million women and men go to a Planned Parenthood affiliate for yearly checkups) and President Barack Obama’s measures to protect the organization, Republicans still plan to gut funding under the new Trump administration. 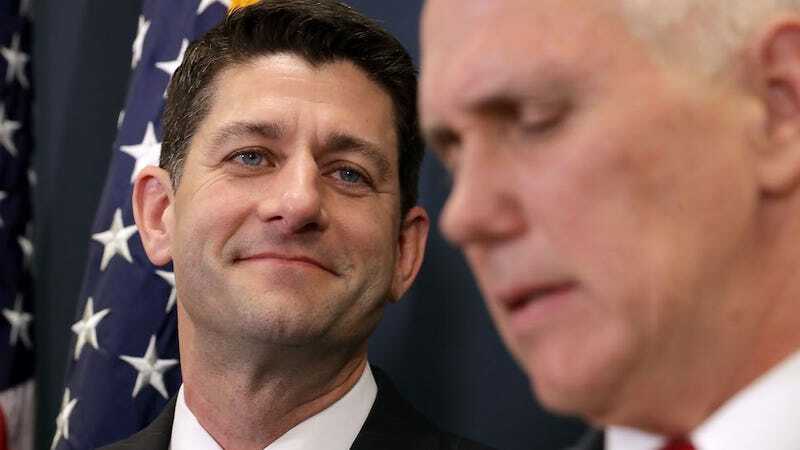 “Planned Parenthood legislation would be in our reconciliation bill,” Ryan stated during a press conference on Thursday, referring to the congressional procedure that allows legislation to pass with only simple majority rather than a supermajority, bypassing any attempts at a filibuster. With Republicans having a 52-48 Senate majority, Democrats are preparing for an uphill battle when it comes to blocking the reconciliation bill. Sadly, with the vast majority of Republicans wanting to harm women (and men!) by restricting their access to reproductive healthcare, DeGette and her allies’ efforts probably won’t be enough. Donate to Planned Parenthood here. While you’re at it, why not call Paul Ryan’s office and share your thoughts? Republican leaders are launching their crusade to take health care away from millions of people across America and increase health premiums for millions more. The resolution introduced last night is the first step in the process of repealing the Affordable Care Act, which has helped make historic gains for access to health care. Repealing the ACA means that more than 55 million women would lose their access to no-copay preventive services such as birth control and life-saving cancer screenings. It would mean that being a woman would once again be a pre-existing condition, and health insurers could deny health coverage to tens of millions of women. And nearly 30 million women, men and young people, 82 percent of whom are in working families, would lose the health insurance they gained through the ACA’s Medicaid expansion and private insurance. This makes Trump advisor Kellyanne Conway’s claim that no one will lose insurance coverage under the GOP ‘plan’ even more puzzling. Her flippant and dismissive statement ignores the important ACA benefits that people rely on. Will women continue to get the birth control that works best for them without a copay? Will young people still retain the security of staying on a parent’s plan until age 26? Everyday people care about these issues and how they affect their lives and pocketbooks. That’s why Americans across the political spectrum don’t want these dangerous and backward policies. The public believes it is wrong to tear apart their health care without knowing what the replacement plan is to keep their families healthy and financially secure.